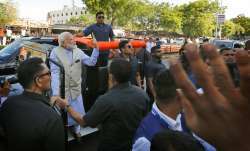 The result left Madrid in danger of losing third place to Valencia, which is two points behind going into its match at Athletic Bilbao on Wednesday. 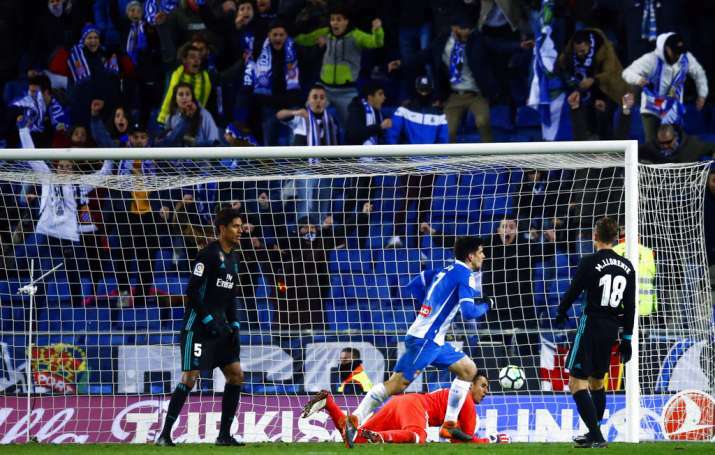 Real Madrid couldn't overcome the absence of Cristiano Ronaldo and other regular starters on Tuesday, losing 1-0 to Espanyol in the Spanish league to see its five-game winning streak come to an end. The Los Blancos' attacking play was never doubtful until the time it was to find the back of the net. Despite hogging all the possession, it was Espanyol who have more shots on target and a better accuracy of passes than the visitors who saw the hosts collect three points at the death of the fixture. Image Source : APReal coach Zidane gestures during the match. 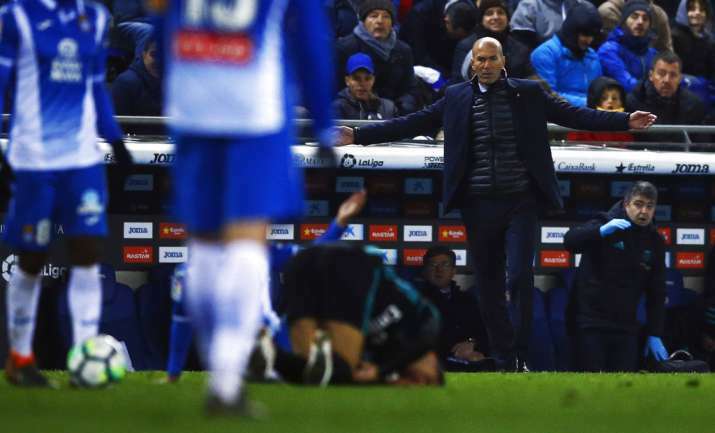 "We didn't deserve this goal in the last minute," Madrid coach Zinedine Zidane said. "We played well, created chances, but things didn't go our way in the end." Toni Kroos, Marcelo and Luka Modric also did not play as they try to recover from injuries for next week's game against PSG. Casemiro was left out because of a stomach problem, while Dani Carvajal and Karim Benzema started on the bench. Gareth Bale played up front along with Lucas Vazquez, Marco Asensio and Isco. The midfield had Marcos Llorente and Mateo Kovacic, and the full-backs were Nacho Fernandez and Achraf Hakimi. Benzema replaced Isco in the 69th minute. Espanyol, 13th in the league standings, hadn't won in seven matches, since it ended Barcelona's 29-match unbeaten streak in the first leg of the Copa del Rey quarterfinals in January. Its last league win came eight rounds ago, at Levante. It had already beaten Atletico 1-0 at home and drawn Barcelona 1-1 in the league. "It was more or less the same against Atletico and Barcelona, we found a way to win in the end," Moreno said. "This result restores our confidence after a series of poor results."